I am a 43 year old Singaporean, married with no kids. I have three beautiful dogs at home. I was fairly active during school days with swimming and Judo, but after I started working in a business development, with frequent traveling, entertainment, social engagements and unhealthy eating, my weight ballooned from a 67kg in 2002 to a 96kg. On numerous occasions, doctors had advised me to consider regular high blood pressure control medication. 1. First up - Tell us a bit about yourself. short background on work/ life/ sport etc etc / how did you come into tri? In 2012, I moved to my new home near The Central Catchment Area, which was ideal for long walks with my ‘hyper’ dogs. The walking then gravitated toward running, and this -kick- started my venture into triathlon. 2 What do you like about triathlon, what keeps bringing you back fro more. I remember a more experienced triathlete sharing that triathletes are all sadomasochistic SOBs. I often wonder whether I seek gratification from persevering through 'suffering and pain' Hahaha. After gaining a certain amount of stability and success in life, there was a part of me that wanted to test and stretch my physical boundaries. I was not born a natural athlete; in school I never excelled exceptionally in any sports. But with new found motivation gained from running and losing weight, I began to feel better about myself. I started swimming with a local tri club in 2015 and eventually picked up cycling. I properly caught the tri bug after my first OD race where I clocked a decent 2hr 40' as a newbie. 3. Tell us abit about the journey so far - memorable highlights / low points. What are your big dreams? I enjoy the competitive nature of racing against other age- groupers. The harmless banter between my squad mates and the post race celebration make triathlon fun and addictive. Coupled with my ‘number-chasing’ personality, nothing gratifies me more than seeing the little progressive improvements on the journey. I was very glad to qualify for the Challenge Championship 2017 in Slovakia and raced ‘behind’ some of the biggest names in the sport like Sebastian Kienle! It was exhilarating! I hope to qualify for the Ironman 70.3 World Championship in 2019 and hopefully get to Kona someday. 4. Briefly talk us through the race. High/ low points during the race. Standout thoughts at certain points in the race. 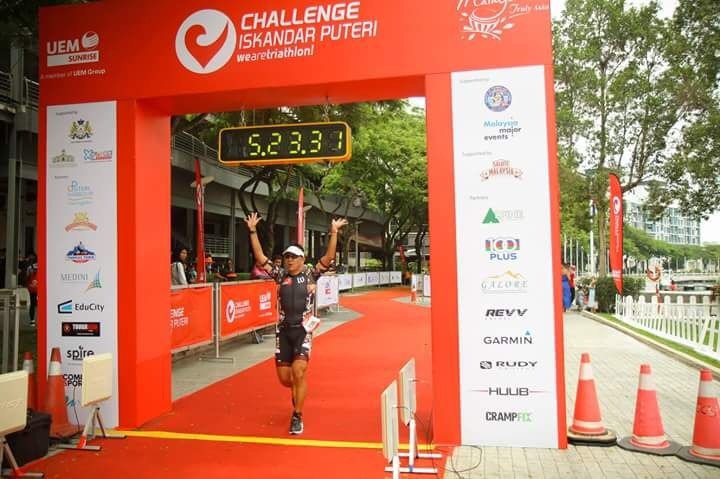 Challenge Iskandar Puteri 2017 was the build-up race for my 1st full Ironman in Busselton December 2017. I was planning to use this race as a ‘progress report’ for my relatively short triathlon career. I went for the race with the goal of learning how to manage unforeseeable and difficult conditions such as the stiflingly hot and humid race conditions. Instead, at the end of the 2nd loop on the bike, a thunderstorm brewed and hit hard. The winds were howling and I remembered telling myself," Ahhh great, this is like practicing to tackle the infamous headwinds in Busselton!" Huge pellets of rain fell and puddles formed on the uneven and sandy Malaysian asphalt roads, but ultimately I still managed to put out a 2’27hr bike split! The run was even more memorable. I have always been able to execute my training runs well but somehow always failed to deliver on race day. For this race, I was experimenting with a high stride rate run with smaller steps, as a new nutritional plan, hoping to run a below 2hr half marathon. The sun came up on the run, humidity was high and in fact it turned steamy. I remember telling myself to ignore the pace and focus on cadence and executing my race nutrition plan. I was very glad to complete the run below 2 hrs, at 1’56hr - my bestrun off the bike so far. 5. How did your physical training prepare you for the race? Talk a little bit about your training. Can you briefly describe your weekly training schedule. How and why that's working for you. I work with Shem on my training program. It’s a 7 day/week training program comprising at least 1 hour per day on swim, bike or run and with longer sessions built on my free days and the weekends for long outdoor ride or endurance runs. I used to swim predominantly when I first got into Triathlon. Slowly I added the runs, then track sessions and eventually the grind on the bike. With my coach, I have been able to progress on all three disciplines; in fact, the bike, which used to be my weakest link is now my strongest!! Not that I got worse on my swim and run, just that as I achieve newer highs on all three disciplines, I am discovering biking can indeed be my thing. 6. I always stress the importance of communication in the coach -athlete relationship. Your thoughts on this please. Yes absolutely. In my opinion, the coach is not merely a training schedule generator. He needs to be able to assess/understand how the athlete is progressing and feeling. And in order for the coach to do that, it takes both hands to clap: the coach being able and willing to listen and the athlete being open to peel off his layers and being honest with his coach. This is communication. With Shem, I was able to feedback what I needed to improve at different stages over the course of racing for this past 1 year: a) my swim - imagine a 4K swim set with 2k drills on body balancing!, b) bike - 20min *2 Time trial tolerance set so I can improve speed and ‘suffer’ and c) run - ignore pace, slow down but high cadence more than 180, and at times bring it in at 184-186?! This is the result of good communication. 7. Any 'life lessons' you've picked up along the way? 8. What are the benefits of having a coach? What are the characteristics for a good coach to look out for? When I first started triathlon, I think my training on my own was really haphazard. I tended to pick a discipline I feel like doing for the day and that ultimately geared towards the discipline I enjoyed the most. With a coach, he reels you in. Ultimately triathlon is not merely 3 sports. It is 1 singular sport with 3 disciplines raced and gelled together as one. We report our race timings as one. Not just as individual splits. I think my coach helps me understand this. 9. Think you can go quicker... ? I have also signed up for Challenge Roth July 2018.